The complex nature of Indian society is such that outsiders may be unable to see past its outer layers down to a level which reveals the difficulties faced by girls and women: a caste system which excludes individuals on the basis of birth, and a dowry tradition that causes daughters to be seen as burdens until they can be married off. As a result, girls are often devalued and forced to stay home and care for siblings, work to help support their families, or marry to ease the financial stress. School is a luxury many will never experience. Girls in India often face other challenges which make obtaining an education difficult. Those who are enrolled may lack necessary educational supplies and hygiene items, or be unable to obtain adequate meals when not at school. For those living in unsafe environments, regular attendance can difficult or even dangerous. While some are lucky enough to obtain sponsors, waiting lists are long, and some never receive the support they need. These issues may also be compounded by the fact that mothers who are uneducated may be unable to see the need for their daughters to attend school, or simply lack the self-confidence required to begin improving upon their own position in life. 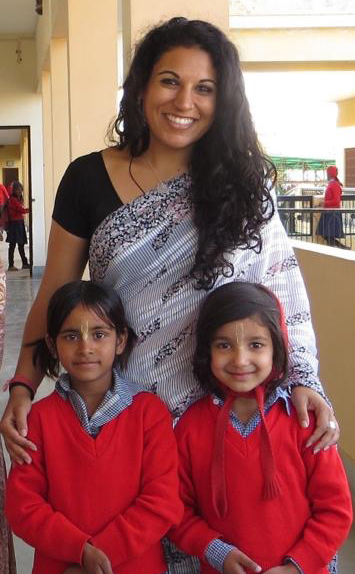 Reshma Thakkar witnessed the struggles faced by Indian girls and women firsthand on family trips to her native land. Born and raised in the United States, she felt compelled early on to do something for others who had not received the same opportunities she had. Fortunately, a highly-successful career as a healthcare IT consultant allowed her to sponsor the education of two young girls (photo on the right) in the town of Vrindavan. After learning a relative of one of her girls was being forced by her parents to marry and leave school, however, she knew that something had to be done right away to keep others from the same fate. After a great deal of soul-searching and many sleepless nights, an afternoon spent helping her parents prepare for a move provided the spark she needed to begin turning her dream of helping others into a reality. THANK YOU FOR SUPPORTING OUR MISSION AND JOURNEY!